Sequin Art color by number pages allows you to color number of pictures with shiny disc shaped beads.It's a great way to relieve stress,unleash your creativity and relax and stay calm.Choose from a number of colored pages in the app to create your own artwork like an artist. 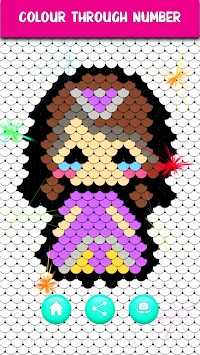 Sequin Art is a unique look with simple concept which will make your child feel comfortable with this app.Catch the creative moments and turns the house images into the colorful sequin artworks. - Select a category which you want to paint. 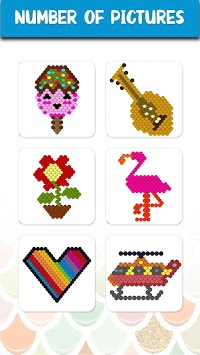 - After selecting picture, disc shaped beads appears. - Select the number from bottom line,click on the brush and drag your finger on the appeared numbers. 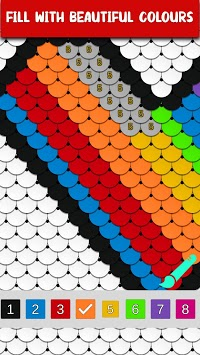 - After completing all numbers from bottom line,picture will be clear in colored beads. - Trains your concentration and steadiness,practice your drawing and coloring skill. - Enjoy creating anti-stress bubble images. - Sequin Art helps children develop better hand-eye coordination and recognition of shape and number. Great activity to practice color therapy and your imagination skills.Just shelter from the stress of life and complete a variety of unique anti-stress artworks. You can download your completed drawings and set them on screen of your phone.